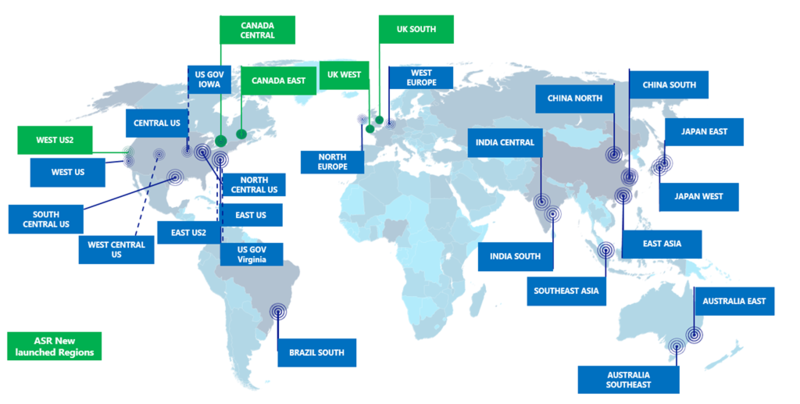 To increase our service global footprint, we recently announced the expansion of Azure Site Recovery to Canada and UK regions. Apart from these two new countries, we have also deployed our service in West US2, making it available to all non-government Azure regions in the United States. With this expansion, Azure Site Recovery is now available in 27 regions worldwide including Australia East, Australia Southeast, Brazil South, Central US, East Asia, East US, East US2, Japan East, Japan West, North Europe, North Central US, Southeast Asia, South Central US, West Central US, West US2, US Gov Virginia, US Gov Iowa, West Europe, West US, North East China, East China, South India,Central India, UK South, UK West, Canada East, and Canada Central​. Customers can now select any of the above regions to deploy ASR. Irrespective of the region you choose to deploy in, ASR guarantees the same reliability and performance levels as set forth in the ASR SLA. To learn more about Azure Site Recovery visit Getting started with Azure Site Recovery. For more information about the regional availability of our services, visit the Azure Regions page.